Our "Seaclusion beach front home" is a high end beach front home located in Redington Shores, Florida. Redington Shores is south of the famous Clearwater Beach, it is an ideal place to relax and get away from it all. The water is tranquil and inviting and the views will capture your attention from every angle. if you are looking for a wonderful vacation in paradise, then you have found it here! Relax on one of our 3 beachfront balconies with breathtaking views or enjoy time indoors in our open living area. Wireless internet is complimentary. A fully equipped kitchen with new, amenities such as granite counter tops and stainless steel appliances make cooking at ease! On the first floor you will find a large garage along with a lounge area with a ping pong table and other games. On the second floor you will encounter out open floor plan with the kitchen, living room and one bedroom with a queen bed. The master bedroom is located on the second floor, it features a king bed, a private balcony overlooking the Gulf of Mexico and a large luxury private bathroom. There are two other bedrooms on the second floor. One of the bedrooms has 2 twin beds and the other has one king bed. On the third floor you will find the den/loft with a sleeper sofa, the den offers has a large balcony overlooking the water and that is great spot to throw the air mattress down to sleep 11 total people. The private elevator runs along 3 floors. This incredible property is one of our high end rentals and books up early. We do have last minute special price cuts on cancellations. Please check our official calendar on this site for real time availability and to hold the house online. Online bookings do get preference and there is no obligation to holding any of our houses online. Lowest prices in Sept., Jan., Oct., and Nov. Excellent property. We have stayed at multiple properties along the beaches of pinellas county and this was by far the best. Thank you Alan for making your home available. Awesome property with everything you would ever require. The elevator on site was the ultimate factor for my 90 year old mom's birthday celebration. The location of the condo was great. It is just far enough from the more popular areas to give the beach frontage peace and quiet while not being to far from eateries. All 9 of us slept comfortably. We managed to park 4 vehicles in the driveway/garage. The roof top deck with attached room was my favorite spot. While there were a few issues, none would prevent me from returning. What I did not like was the lack of access to the garage/bottom rec room. You could only get there by elevator or using the garage code on the kitchen level. The only exit from the living area were stairs in the front of the house. These two issues caused me a bit of safety concern primarily and secondly an inconvenience. While the fixtures seemed dated, the house appeared to be clean. Great spot, missing the finishing touches. Our group of 8 uses VRBO often. This location was perfect for us. However, we immediately had to go out to purchase toilet paper, paper towels, dishwasher detergent and ice. The ice dispenser was broken as was the door spring on the dishwasher. Our request for a repair on a window blind was addressed quickly. Thank you for taking the time to leave a review. Per our paperwork for check in we only leave enough product that can be used up to get you started and that does include toilet paper, paper towels, etc. This was my second time at this property. Love the location, property and staff are very easy to work with. Love this place! Thank you for coming back to the Seaclusion home! Look forward to having you again soon! The best airports are Tampa International (25 minutes) or Clearwater/St. Petersburg airport (20 mintues). The house is a 30 minute drive to Busch Gardens and a 90 minute drive to the Disney, Universal, MGM, Epicot and Sea World theme parks. Located just north of downtown Clearwater. 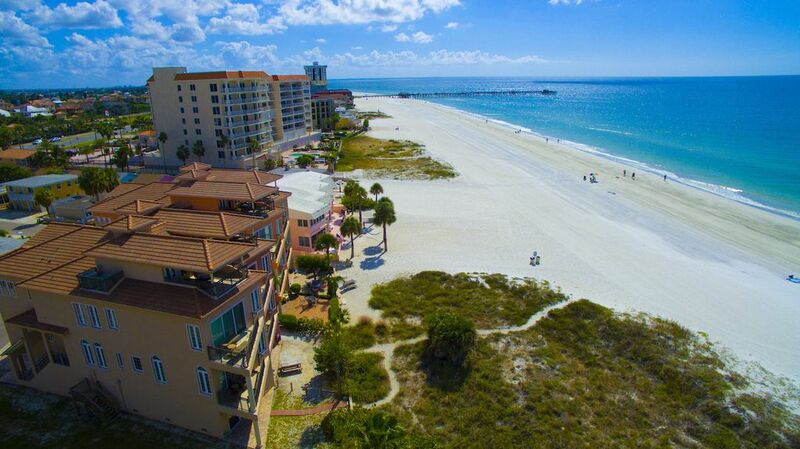 We have a wide range of properties between Clearwater Beach and St. Petersburg Beach. Please call us or email us, as we are always running specials. Last minute travelers with flexible travel plans can sometimes get bargains by checking with us for last minute deals on beach rentals. You can save up to 50% on any of our beach properties! Please log on to our website for more information or call. Please be aware that we don’t update the calendar on this site, log on to our official webpage to check availability for all of our properties. If the property you inquired for is not available, we may have several comparable properties available. We have a wide range of properties throughout the beach so please call us directly at 8 0 0 . 7 9 2. 1 4 4 9 or email us through this page.